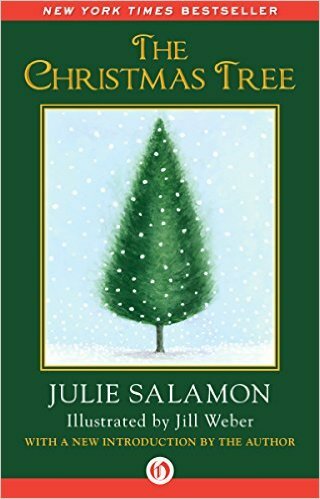 The Christmas Tree, by Julie Salamon was one of my personal reads this Christmas season. (You can see what the kids and I have read this year HERE.) I picked this title out of a list of recommended Christmas reads over at Goodreads. This title caught my eye because of the simplicity of the book art design. It looked cozy and calm and that's pretty much how I like my Christmas reads. In The Christmas Tree we are introduced to the chief gardener at Rockefeller Center whose job it is to choose the annual Christmas tree which is displayed in Times Square. He's a somewhat jaded fellow who spends a good portion of the year seeking out a tree for the world to marvel at. To him it's more of a chore than a pleasure. I never really thought about how the tree at Rockefeller Center is chosen and so I found this book interesting from that angle alone; it does sound like an exhausting project. It was curious to think about how it's one person's job to fly over forests and property scouting out that perfect tree which helps represent the magic that is Christmas, not only to New Yorkers but to people all over America. The gardener in this story is told about a possible Norway Spruce which is located on a piece of private property which is home to an Abbey. The Sisters of the Abbey are willing to let him take a look at their tree but he soon discovers that this tree holds a special place in the heart of one of them. It is one nun who has to grant permission for him to take the tree and she's not quite ready to say goodbye yet. The story revolves around the gardener, the nun and the tree. On this rather remarkable journey we learn to appreciate people and their individual stories over "stuff". The Christmas Tree is a beautiful little story. It took me all of an hour to read but it's the sort that will stick with me for much longer. I loved it and will be keeping it around to reread in the future. Highly recommended. Sounds like a sweet story! I'd hate to be the one with that responsibility. This sounds like a good, sweet story!